Geoff graduated from Otago in 1984 and has been in practice on the North Shore ever since, including the last 28 years in Milford. He has been married to Sandra for 30 years and they have 3 children, aged 26, 21 and 16, and resides in the local community. His interests include road cycling, boating and fishing. 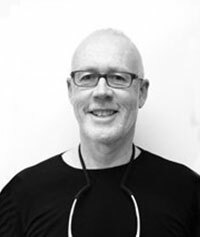 In 2006 he merged his solo practice with Andrea Clarke and joined Milford Dentists. He is proud to provide pragmatic effective treatment using up to date methods and tailoring this for each individual with a holistic emphasis. He has been a non amalgam Dentist since the mid 90s and enjoys looking after a range of people of all ages. Patients say that they like the friendly relaxed atmosphere and clear explanation of what is being done. Geoff Moulder has been my Dental Care Specialist for the last 15 years. When I first came under his care I had a heavily filled set of teeth, all molars filled with silver amalgam, quite a few Root filled and pinned teeth with discoloration and bits broken off. Progressively over this time, Geoff has replaced all my fillings with white composite material, glued on layer pieces and replaced half snapped front teeth. He has fitted a number of white glass Crowns and root filled where necessary; so that I still have all my original teeth, though skilfully modified. As the Senior Technical Officer of Chemical and Materials Engineering at Auckland University for 30 years, I am fully able to appreciate the rare skill, knowledge and dedication that he and his staff have shown in repairing and maintaining my teeth, and therefore my health. I am still a competing athlete in running, multisport, cycling and canoeing. In closing I wish to pay tribute to Geoff (a fitness runner himself) for often achieving the impossible with my teeth and even approaching miracle status at times. I am a 65 yr old man having had numerous dentists work on my teeth over the years, some were good some particularly bad! Geoff Moulder was referred to me by my GP, commenting at the time, that he was reasonable with his charges and liaised closely with his patients to ensure that the received the best treatment they required. I decided to make an appointment when I had a tooth ache, just prior to my wife and I going over seas. Geoff arranged for the tooth to be removed, I have returned on several occasions to have repairs to broken teeth and a crown. In doing so at no time was there any discomfort, I felt totally relaxed and comfortable throughout the procedures. One last but very important consideration, that Geoff has, is to colour match your own teeth, which he has done superbly with me.